Leo Tolstoy begins Anna Karenina with a premise that “happy families are all alike; every unhappy family is unhappy in its own way.” The same is true of family-based immigration. All good family immigration cases usually represent stable and enduring family relationships that are capable of surviving and thriving despite the adversity of the U.S. Citizenship & Immigration Service or the U.S. Department of State, whereas each problem case is problematic in its own way. Unlike employment immigration, where the benefits of U.S. permanent residence are often accorded on the basis of the U.S. employer’s intent to offer permanent employment to the alien and the alien’s intent to accept the employment offer, the existence of a qualifying family relationship at the time of filing is a prerequisite to establishing eligibility for immigration benefits in all family immigration cases except special immigrant juveniles, orphans, and intercountry adoptees. 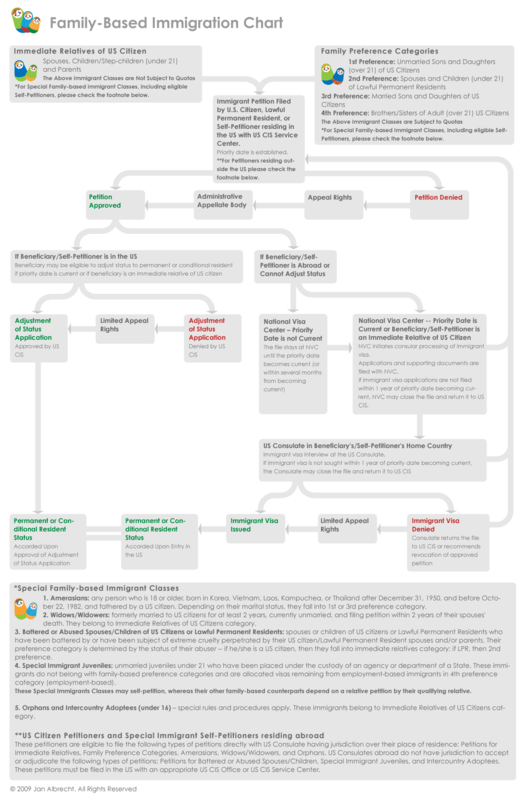 The following chart illustrates the basics of the petition process for family immigrants.